Daniel Kahneman tells us that humans have two decision making systems. The fast system one is automated, semi-conscious, and occurs frequently throughout the day. The slow system two is highly cognitive and computationally intensive…requiring lots of energy so we use it sparingly…only when we really need it. 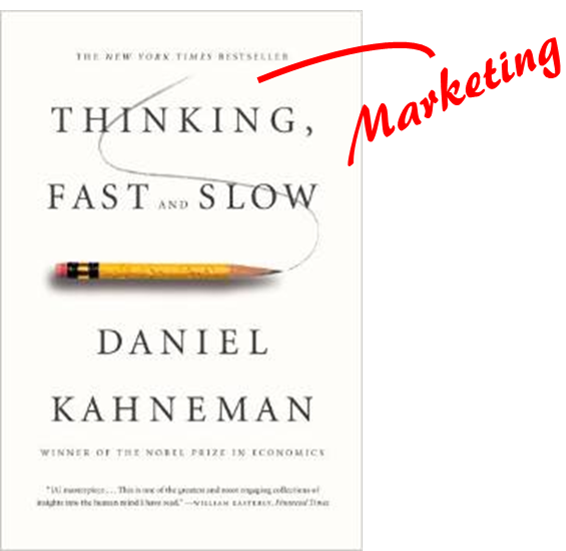 Marketing used to be a slow decision business. When I first joined Unilever in the late 70s, market share data came every two months from Nielsen. Marketing plans were set for the year, maybe adjusted quarterly and just about all advertising was scheduled well in advance. There simply were not a lot of decisions to be made and not a lot of data to make them on. In fact, the whole world was slower. News came at us only once or twice per day, not continuously as it now does. We shopped only when stores were open, watched TV when the show was scheduled. Most “female heads of house” were not working. Life was synchronized and that made marketing easier to understand. Today, the marketing world is totally different because the cadence of life is different, driven by technology. It is a fast, daily decision business. Torrents of data, such as web analytics and social media conversation come at us continuously. Marketing decisions are being made each minute, by trading desks rather than people (again, our heads would explode), in the form of programmatic advertising and real time bidding for an impression opportunity in the two-tenths of a second it takes a webpage to load. In our industry, this activity occurs billions of times per day. Programmatic media buying is a lot like system one…little cognition at the time of tactical action, fast automated decision-making, occurring millions of times per day. The advantages of programmatic are both automation (taking cost and effort out of the system) and improved results by doing better at delivering the message to a given user that is likely to produce response. And programmatic is a big deal; for example, Kellogg’s shared that it spends about one fourth of all above the line marketing funds via programmatic buying. This will only grow across the industry; why, because it works! Of course there will still be a need for slow, system two decision-making when it comes to brand and innovation strategies. It is important to recognize that you should NOT rush through these studies and decisions like they are system one problems…they are not. Programmatic also changes the organization. Kellogg’s implements programmatic buying via its own private trading desk. That repositions the role of their media agencies. Furthermore, programmatic encourages placing greater importance on marketing brands as media. Brands can accumulate their own audiences, attracted with content, and that yields a data dividend that makes programmatic a rifleshot approach to marketing. So now I come to marketing research. Despite all of this change…from slow decision-making, to fast decision making based on automation, algorithms, and data…most research teams are still operating as if it’s a slow world. We might be conducting research in faster ways, but we still have this insights model in our head where we conduct a survey, pick at the data like buzzards, and develop insights on a project schedule that stimulate thinking but have no direct connection to decision making. Consider tools that guide our marketing investments, brand tracking and marketing mix modeling. These tools serve both fast and slow purposes yet because they are caught in between, they don’t do either very well. Trackers aren’t fast enough to help campaigns in flight, and they are a backhand form of strategy research that doesn’t provide as much value as it should because it is on a reporting schedule and survey time limitation. Also, brand attribute ratings are not directly targetable; they do not exist as profiling variables in the ad tech ecosystem. Marketing mix modeling informs media strategy, but it does so as a report card on the past so it can’t be used to move money around…it is a system two solution for a system one need. It also doesn’t help with burning issues, such as how to rework marketing around content marketing, native advertising, cross-media and cross screen optimization. Most marketer-side research teams have changed their nomenclature to insights or knowledge. In light of marketing becoming real time, that feels incredibly system two, leaving a big value-add blind spot. Research teams must accept the challenge to drive up marketing ROI based on aligning studies to digital media targeting options. Researchers must learn digital so they can move beyond insights to prediction, using digital data appending to surveys so results from trackers, segmentation studies, and concept tests can be used directly for system one action.